These two companies are locked in a graphics processor battle -- but NVIDIA continues to prevail. 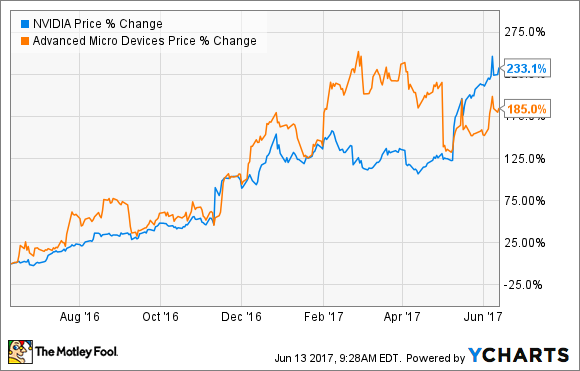 NVIDIA (NASDAQ:NVDA) and Advanced Micro Devices (NASDAQ:AMD) have both given their investors something to write home about over the past 12 months. AMD's share price is up a staggering 185%, and NVIDIA has outdone even that, rising 232% over the same time. But while both GPU makers are doing well right now, only NVIDIA is investing in more long-term prospects that should help the company continue growing into the future. NVDIA and AMD share price change, data by YCharts. NVIDIA makes the majority of its revenue from its graphics processors for gaming, which bring in about 53% of its total revenue. NVIDIA managed to grow revenue in this segment by 49% year over year in its fiscal first-quarter 2018. Meanwhile, AMD makes the majority of its revenue from its computing and graphics segment, which saw revenue rise 29% percent year over year in its first-quarter 2017 to $593 million. But NVIDIA is by far the more successful company when it comes to GPU market share. The company dominates with 72.5% of the discrete desktop GPU market share in Q1 2017, while AMD has just 27.5%. NVIDIA's market share position certainly gives it an advantage over AMD, but it's the company's collective endeavors in other markets that make it a far better long-term investment than AMD. NVIDIA Telsa V100 data center GPU. Image source: NVIDIA. NVIDIA has three huge growth areas that should help propel the company in the coming years, including driverless cars, data centers, and virtual reality. Let's look at driverless cars first. NVIDIA's second-generation driverless car supercomputer, Drive PX 2, began shipping just last year, and it's already used by 225 automakers and researchers. Tesla uses part of NVIDIA's system for its own semi-autonomous tech in its vehicles, and NVIDIA has already turned this into a revenue-generating business that accounts for 7% of its top line. Considering that driverless cars are expected to become a $77 billion business by 2035, it appears NVIDIA is already on the right track. NVIDIA is also taking a leading roll in the virtual reality market. AMD has an opportunity to benefit here as well, but NVIDIA's leading GPU position makes it the logical choice for VR device makers, and its currently superior graphics cards mean that it's likely to retain the lead for VR processors for the foreseeable future. NVIDIA already has a suite of tools for VR developers to help them create new VR experiences, and recently unveiled a new VR collaboration environment, called Project Holodeck, that allows several people to meet together in a photorealistic VR world. If all of that weren't enough, NVIDIA is also building a massive opportunity in data centers. Revenue from the company's data center segment nearly tripled in fiscal first-quarter 2018, and the company already helps power data centers for Amazon, Facebook, Microsoft, and others. That's important because data processing is getting more reliant on image processing -- which NVIDIA's GPUs are very good at -- and that is causing more companies to look to NVIDIA for some of their data center needs. In addition to NVIDIA's dominant GPU role and its rising opportunities in the markets I mentioned above, the company also pays a small dividend of 0.34% with a payout ratio of 17%, while AMD doesn't offer any dividend right now. NVIDIA's lead in nearly every market where GPUs are used gives the company a clear advantage over AMD right now, and its burgeoning endeavors in growing markets mean that even with its past gains it appears this stock still has room to grow.